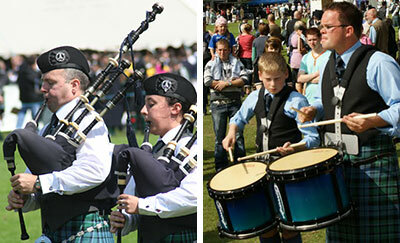 In September 2003, the Inveraray Piping Project was born. With the assistance of local people, Tuesday nights at Inveraray Primary School became the time and venue for weekly piping tuition and practices and the small group began to grow. By May 2004, there were five young pipers- including Laura McMillan, Laura Underwood and Alasdair Dempster- and a drummer, Graeme McMillan, who remain members to this day. In the summer of 2004, Stuart was joined by Dougie Campbell, who was at that time living in Dunoon, to assist with the teaching at these meetings and an ethos of player improvement through individual teaching was developed. As the intensity of the project increased, a Sunday meeting was soon added, a balance always being struck between the hard graft, on the one hand, and recreation and team building on the other. Winner of the overall Scottish award for Best Lottery Funded Project (and a win in the UK-wide “Local Legend” category for Stuart Liddell) in the National Lottery Awards. Prize winner in all five RSPBA major Championships in the Novice Juvenile grade in IDPB’s first full year. Winner of four out of five Novice Juvenile major championships, including the Worlds. Winner of four out of five Juvenile major championships, including the Worlds. Winner of all five major championships in Grade 2. During this period, the next generation of Inveraray Piping Project was being developed by Stuart with assistance from local pipers Kate Paton and Robert Stewart. As a result, a new Novice Juvenile band was formed in 2008. Robert agreed to take over the reigns as Pipe Major of the new band, which facilitated the continued development of the senior band. The success of the band continued in 2011, but unfortunately the season was tinged with sadness when in May of that year Robert Stewart passed away after first suffering a stroke and then latterly being diagnosed with leukaemia. 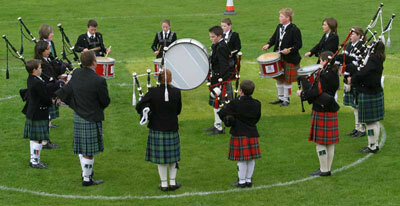 The day after Robert’s funeral, the band produced a fine performance coming 5th overall at the Scottish Championships. The highlight of the season, however, was coming 4th overall at the World Pipe Band Championships, in what was only the band’s second year in Grade 1. The band continues to be a regular prize winner at the major events and a centre of excellence built on strong foundations. The attention to detail and focus on individual and collective playing quality that were a feature of its embryonic beginnings remain to this day in all sections of the band. The current incarnation of IDPB is less parochial- in fact, truly international- with members from several continents. The membership features highly decorated individual performers; graduates of the Royal Conservatoire of Scotland; an abundance of capable composers and arrangers, and several performers with a wider musical pedigree than purely piping or drumming.